An idea of safari…fed by the writings of the ‘Great White Hunter’ and American novelist Ernest Hemingway. A dream of the African way of life…inspired by the experiences of author Karen Blixen and brought to the big screen in the Academy Award-winning film, Out of Africa. The image of rolling savannah dotted with wildlife roaming free. Taking me back to another big-screen offering that filled my young days with wonder, the heart-tugging Born Free. How then could I have resisted the temptation to wander the Dark Continent’s grasslands, albeit in a 4×4, and know something of the safari way of life? We leave the continent’s eastern coastal country Kenya’s capital city, Nairobi, with its incessant traffic, from Wilson Airport, gateway to the magical interior lands, in a Safarilink chartered flight. We are headed for Lewa Downs in the north of the Equator which straddles kenya. I feel the load of urban pressures fall away as the light aircraft climbs higher into the white clouds in a brilliant blue sky. The 45-minute ride is soon over and we are landing on an airstrip seemingly in the middle of nowhere. A thatched hut provides shade and another, mercifully, a quick washroom visit. The savannahs roll away in every direction, merging into stunted hills, purple on the horizon. A few scanty acacia and baobab trees dot the grasslands as we set off in our open-sided jeep on our first game drive, not knowing what to expect. 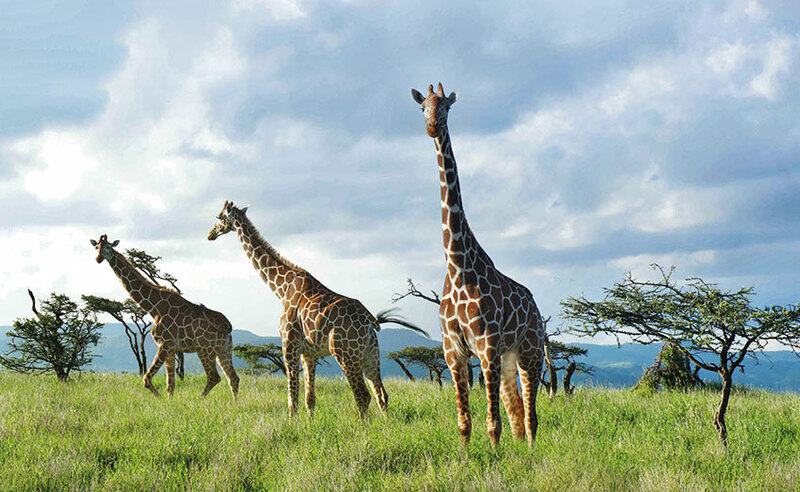 The Lewa Wildlife Conservancy is located in northern Kenya, a UNESCO World Heritage site inscribed in 2013 that practises responsible tourism and is committed to keeping wildlife and communities safe. Community-centric conservation that involves surrounding villages in anti-poaching activities has paid off and, last year, Lewa was one of the few areas in Kenya that did not lose rhinos to poachers. The Lewa team of 150 men and women works tirelessly to protect its 130 rhino as well as its elephants, and have become promoters of peace in the area. But we learn of all this much later. Right now, we are clambering into our designated land rover, destined for an unforgettable ride. The large vehicle seats six and we are soon on our way as another one carries our baggage to our accommodations. Hardly a 10-minute drive along the rough track, we catch sight of a rhino in the distance and, through our driver-guide Labhan’s binoculars, realise that it has its baby alongside. We notice great big horns and a large body under a lone acacia tree. We drive on through scanty outgrowths of the yellow acacia tree that was once blamed for causing yellow fever, though the mosquitoes were responsible. Some impalas are grazing nearby and then suddenly to the left, as if straight out of some National Geographic footage, a herd of galloping zebra crests a ridge, their silhouettes against the great sky, seemingly coming straight at us. They swing left and disappear over the hillside. These are not the endangered Grevy’s zebras, known to inhabit these parts. Along the banks of a river, we follow elephants lumbering along, a calf in their midst. Driving on, standing alone in the middle of the tall grass is a Cape buffalo, his horns majestically huge. He eyes us warily and then leaves his chewing to lumber off. I feel as though Pandora’s box has been magically opened. This is not an experience for diehard animal lovers alone. This is for all those who want to escape the daily prison of urban lives and enjoy the vastness of the landscape and astoundingly raw nature. This is balm for the soul, I think, as I sit on my vantage back seat and peel my eyes onto the horizon. There are areas demarcated where vehicles may wander off-track and right now we are doing just that, the ride getting bumpier and ever more exciting. I am transported right into Born Free’s Elsa the lioness’ magical world as, under a short shrubby tree, we detect a lioness resting her great head. No, two lionesses and two cubs with tracking devices around their necks…. They are sisters, Labhan informs, as they move slowly away into the high grass. We watch in silence and even as we will them to move, one of the lionesses walks towards the jeep, curves around the back and trundles nonchalantly into the short distance. She has been heart-stoppingly close! 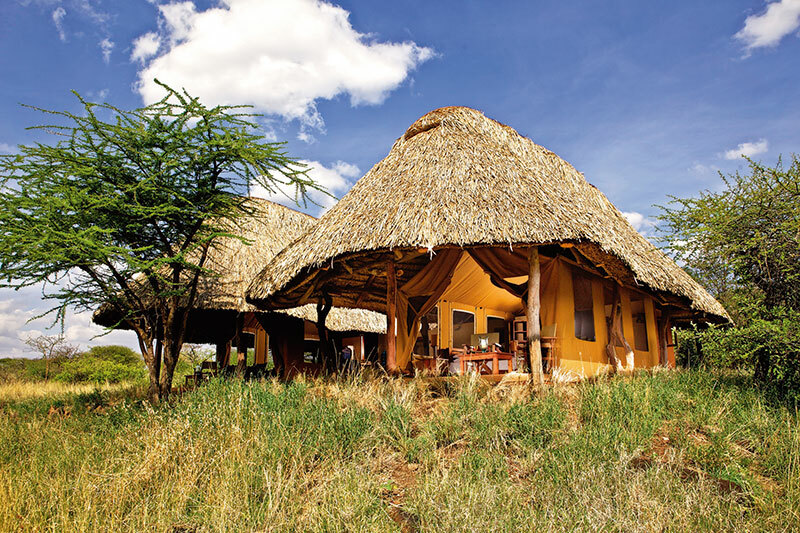 It’s lunchtime and we head off to the Lewa Safari Camp, our picturesque stop for the night. Tamlyn, who manages the estate with her husband Sacha, is warm and welcoming as she meets our jeep and, later, escorts me to my tent, which, with sweeping savannah at its feet, seems perched at the very edge of the world, taking me back to a time of great hunts. Only, it is so much nicer now, to enjoy these majestic creatures, unharmed, in their own environment. We have already encountered four of the Great Five (buffalo, lion, elephant, leopard and rhino) on our first morning. It has been a lucky day so far. 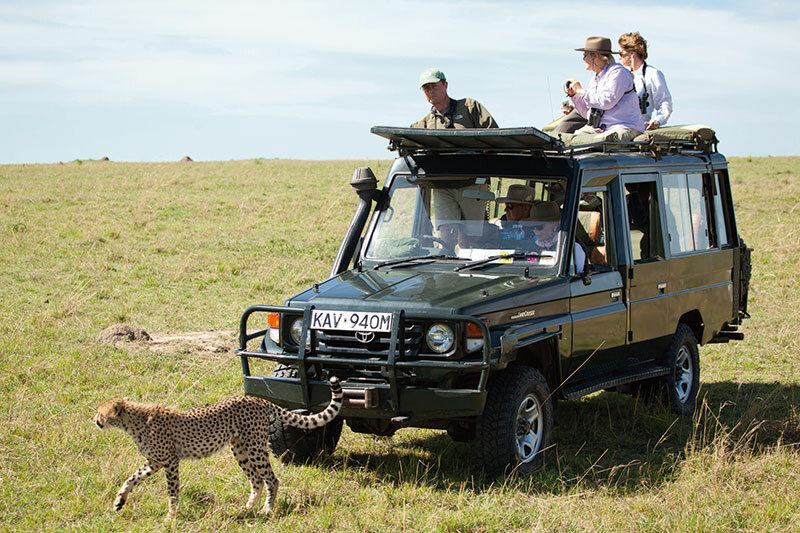 The Lewa Safari Camp offers several exciting activities like walking safaris, a visit to Lewa Conservancy Headquarters, horseback riding safaris and so on, explains Tamlyn. We head out for a game drive in the evening which turns out to be less eventful. We see some beautiful reticulated giraffe, their markings wonderfully precise. They are majestic as they feed on the thorny acacia trees, splaying their long legs to get to the lower branches. We observe elephants, some with tusks broken, on the slopes of undulating hillsides. There are so many smaller animals that need to be viewed and we discover some vervet monkeys in the undergrowth. A line of comical warthogs with their babies trot along, their tails held straight up like antennas, justifying their fond name of ‘Kenya radio’. A herd of gazelle springs to graceful action even as our cameras click and whirl. Driving over undulating landscape, we halt finally on the crest of a hill. And with the savannah spread before us, with a glorious sunset imminent, a bright-red native shawl is spread on the bonnet of the jeep and Labhan sets up a bar right there. Bring out the G&L, the time-honoured drink of hunters. This is the hour for sundowners, a tradition not to be missed. The African sky puts up a show of glorious colour, of unmatched pinks and reds. Later, we return to a sublime fire crackling in the hotel dining room and some Wi-Fi and catch up on worldly matters that seem to have disappeared into the wild. At a delightful dinner with our host Sacha who proves to be as hospitable as his wife, we speak of the appeal of animals in the vast wilderness and swap travel tales that make our lives so exciting. That night, I cuddle a hot water bottle to keep warm, my walkie-talkie and solar flashlight by my side making me feel safe, and wake up to the sound of bird song and some hot tea and homemade biscuits. My tent has been unlocked all night and I feel as though I have been set free! Africa has more large animals than anywhere else in the world, and is the only place where herds continue to roam the savannah. 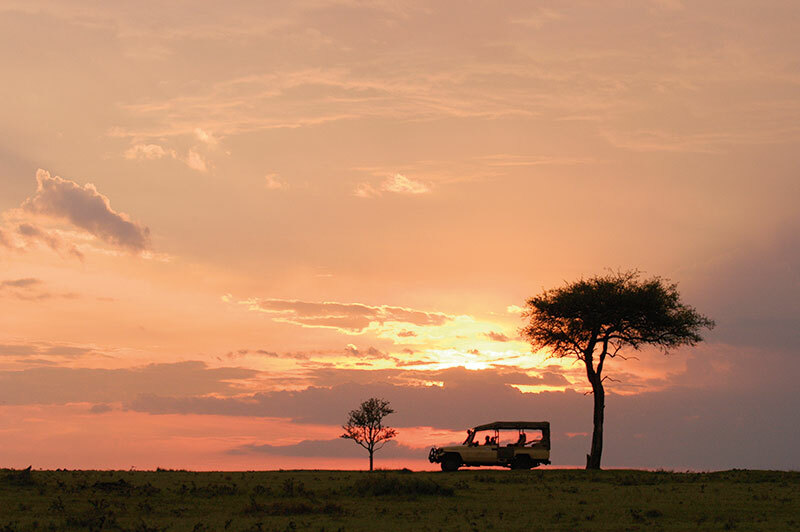 No surprise, then, that it boasts some of the most famous safari destinations. Of these, the best known is the Masai Mara Game Reserve, where we touch down in our small plane, landing at another handkerchief-size airstrip. (Masai Mara means ‘spotted plain’ in Swahili.) Our vehicle awaits and, putting the top up, we head off for a game drive, en route to our lodgings. The Masai Mara Reserve is best known for its large population of big cats, hippo, the rare black rhino and spotted hyena. This is also the venue of one of nature’s most amazing spectacles, The Great Migration, when millions of plains game including wildebeest, zebra, gazelles, move in an ‘endless cycle of birth and death’ from Tanzania’s Serengeti to Masai Mara, reaching here sometime in July and August. This is not migration season but knowing that the big cats do not migrate, we look forward to locating them. Hardly are we out of the airport and we glimpse two lions with glorious golden manes, through some shrubs. The Swahili word for lion, simba, also means ‘king’, ‘strong’, ‘aggressive’ and it is awe inspiring to view these majestic creatures in the wild. These two do not look like they mean to emerge soon and so, when our enthusiastic driver-guide Morange gets a radio call, causing him great excitement, we dash off on the promise of a ‘surprise’. And there he is, right in the middle of the plain, a sight so beautiful, I will never forget. A cheetah, eyeing a troupe of gazelle in the far distance — quiet, waiting, dangerous. We drive close for a few seconds for photographs before we move on. Sand River Masai Mara, our tented accommodation, takes me back to the days of great hunts. Until more than a decade ago, people still journeyed into the bush, as Hemmingway did, with tents, bearers and a white hunter to shoot game rather than view it. But here, on the banks of the Sand River, the animal is king as the upscale ‘resort’ will not allow electric or any fencing to keep wild cats at bay. I sit in the main tent with its vintage-style fittings and travelling-bar-in-a-suitcase and watch some baboons playing havoc by the swimming pool. They slide down roofs, drink deeply from the pool and pose on lounge chairs. Live entertainment in the wild! 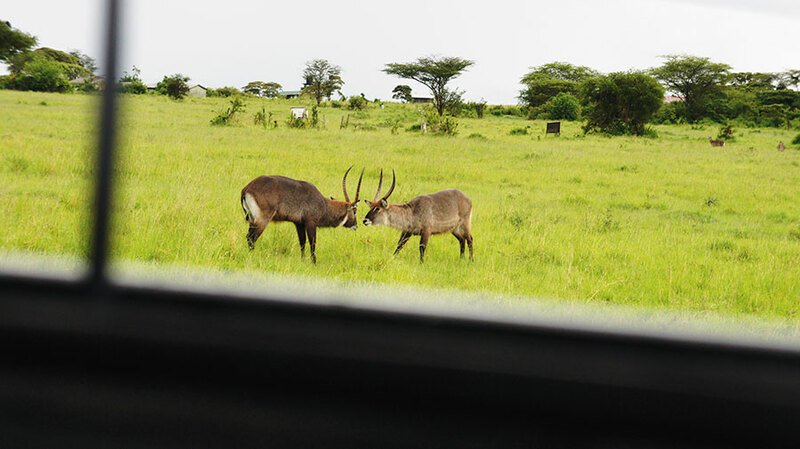 It pours during the afternoon game drive and animals elude us until we come across a spectacular scene of Thomson’s gazelle and zebra grazing. A real treat awaits us as we decide to check on the lions. They have moved out of the bushes and are asleep close to the track. As we watch, one of them awakes, stretches, rolls on his back like a kitten, and sits up groggily. We sit in silence, as watching him makes all our safari dreams come true. Next morning, 4.30 a.m., we are bumping along a track — with some rabbits and a baby hyena caught in the headlights — heading for our hot air balloon launch site, with Balloon Safaris Ltd. Some tense moments at takeoff prove unwarranted as Captain Jack with his Aussie accent displays his skills…the balloon skims over the Masai Mara preserve, within sight of the Tanzania border and the Serengeti plains. Even as a stunning sunrise lights up the sky, we spot deer, elephant herds, a hyena couple, ostrich babies and herds of gazelles. After a perfect landing, we drive out into the bush to a champagne breakfast under an immense tree. A herd of elephants on the far horizon looks like they would love to join the party! Breakfast done and having heard of a leopard sighting that morning, we race to the spot and discover the animal languidly sleeping up in a tree. We sigh with disappointment to discover that this is not Malaika, the leopard we are anxious to encounter, which famously loves jeeps and playfully jumps onto them, leading to much consternation. As the only sign of movement is a twitching tail swatting flies, we move away to investigate a cheetah sighting, over harrowing terrain, bouncing over boulders and around sharp bends to where the magnificent animal rests on a rise in the plain. As we get nearer, he seems to stand up just for us, throws a piercing look and then goes right back to sleep! Later, we investigate a leopard kill and discover the half-eaten ostrich carcass, though the killer evades us. We picnic instead on roast chicken and apples even as we continue our search to no avail. But The Mara, as it is fondly called, is not done with us! As we head home after a tiring day, half a kilometre or so from our camp, we spot two lions sitting right off the path. The next morning, I awake to the shrill singing of a bird to discover, over breakfast at the riverside, that I have missed out on the main event. The lion, right on the camp boundaries, had let out a mighty roar heard all over. Well, I was sleeping the sleep of the plains, dreaming about the secrets that lie in wait around every corner. Nairobi, Kenya’s safari gateway, is the only city in the world to boast a 12,000-hectare park, the Nairobi National Park, with a large variety of animals and birds close to a capital city. 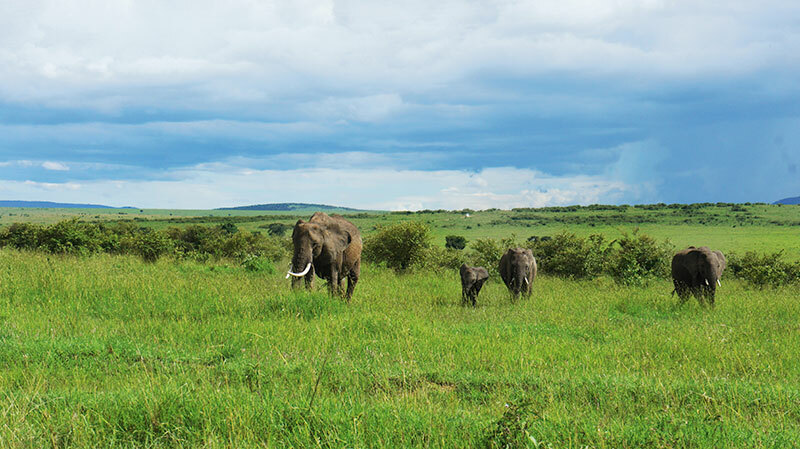 The park is located only 10 kilometres from Nairobi City Centre. Stay: Villa Rosa Kempinski, a beautiful refuge in bustling Nairobi. Also, Crowne Plaza for it’s convenient location near Wilson Airport. Visit: Giraffe Centre which has been set up as a breeding ground for the endangered Rothschild giraffe. Daphne Sheldrake Elephant Orphanage where elephant calves orphaned by poachers or natural calamities are brought from all over the country. Nairobi National Museum to understand the country’s rich heritage and view some amazing fossils and bones. Karen Blixen Museum the home of former Danish author made famous by her books and the movie based on the book Out of Africa. Maasai Market for Kenyan artefacts. 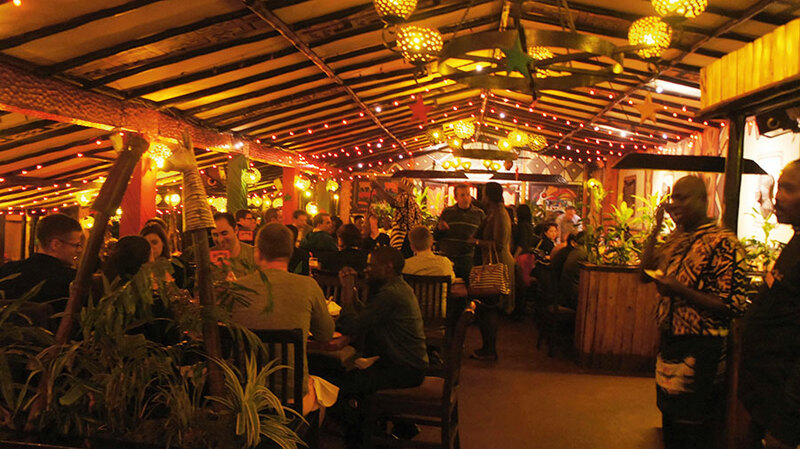 Meat-Fest: Carnivore restaurant, the most famous nyama choma (barbecued meat) restaurant in Kenya. While exotic game meats are off the menu due to strict new laws, camel, ostrich and crocodile meats are worth trying. Down some Tusker beer, a popular local drink. Simple words to make you feel right at home…. 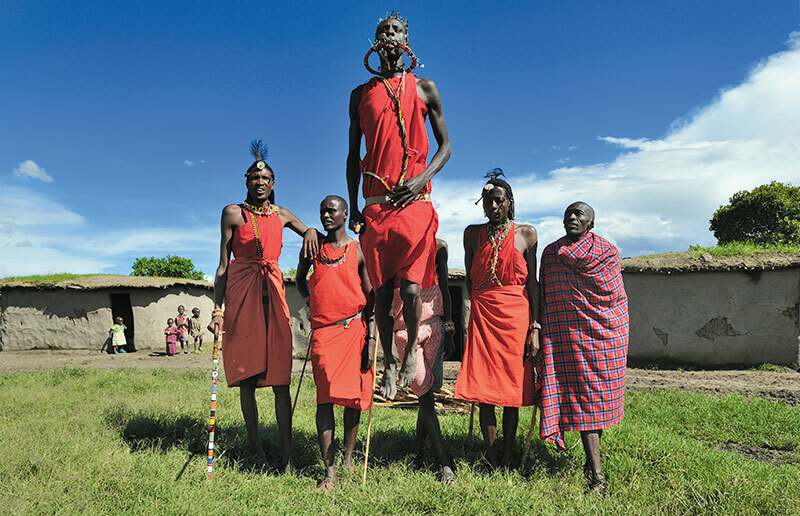 The Maasai village throws up colourful warriors in traditional red dress, a circle of Maasai houses built of wood and cow dung and a village elder with ear lobes that reach his shoulders. A group of colourful Maasai men do a dance that is performed after a lion hunt. They jump and leap for us, for he who jumps highest gets the beautiful maiden! A demo on fire making later, we enter a tiny Maasai home with a smoky cooking fire smouldering in the centre. Maasai society is polygamous which means that men can marry more than one woman, the first bride is chosen by their families, the second by themselves. A man’s wealth is counted in cows and 10 cows make him eligible indeed! There is much that we discuss — including the drinking of blood as part of the Maasai diet — but they assure us that they would never harm their cattle. We visit the Maasai market displayed with bright beaded jewellery, hand-carved animals in wood and stone, shawls, all fashioned by women — apt souvenirs to remind us of our sojourn. End a perfect safari holiday with a couple of relaxing days at the beach. We head out to the east coast of Kenya and get settled at the uber-luxe Medina Palms in Watamu, set on one of the world’s top 10 beaches. The name Watamu means ‘the home of sweet people’ in Swahili and the town is located about 16 kilometres from Malindi Airport. The hotel offers suites, penthouses, ocean front villas and private plunge pools. The Watamu Marine National Park and Reserve offers some of East Africa’s best coral reefs for snorkelling and diving and is one of the oldest protected marine parks in Kenya. It is a UN-recognised World Biosphere Reserve. Deep-sea fishing, paddle boarding, wind surfing, kayaking, dolphin and whale watching are offered. The Watamu Marine Association (WMA) works for the community and conservation in the marine park and lists several eco-tourism activities. We visit the mud flats at Mida Creek, a large saline lagoon that merges with a 1600-hectare mangrove forest and wind our way over a suspended boardwalk that bounces at every step. Traditional canoes carry us across the bay. The next day we visit another part of the mangrove forest that reveals a restaurant on stilts run by the Dabaso community. One of the mysteries of this area is the ruins of Gedi in a forest nearby. 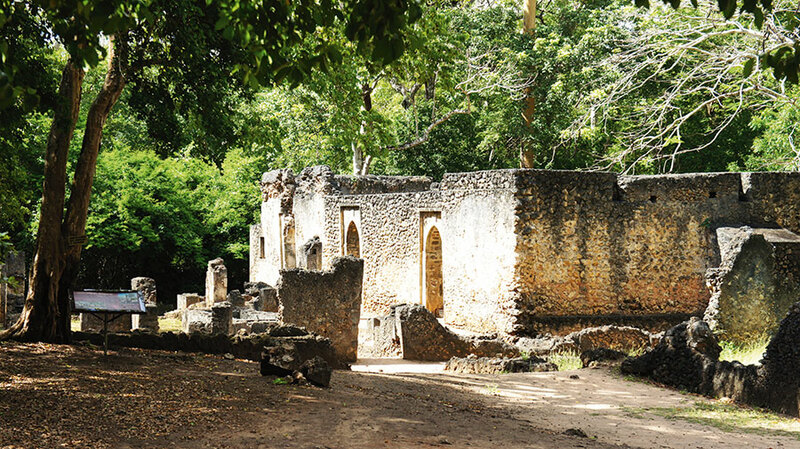 From the 13th to the 17th century, the Gedi were a thriving community and we view the remains of a mosque, a palace and homes. But what happened to the Gedi and why they deserted their fine city is not clear. Tourists are welcomed not only by the local guide but also by Saddam, the resident monkey, looking for treats among the ruins. Getting There: Kenya Airways has non-stop flights from Mumbai to Nairobi’s Jomo Kenyatta International Airport. Vaccinations: Oral Polio and Yellow Fever vaccinations required. Safari High Season: Peak season is from late June to October; the wildebeest migration reaches the Masai Mara in July and August. April and May expect heavy rains. Local Travel: Domestic flights out of Nairobi depart from Wilson Airport. Fly or drive between reserves. Wear: Khaki is the safari black, sunglasses, strong boots or keds, camera, binoculars, sunscreen, mosquito repellant. Buy: Kenyan AA coffee, macadamia nuts, artefacts in wood and stone, Maasai shawls.